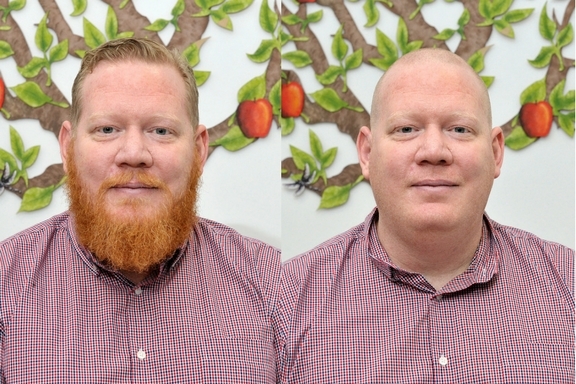 Six brave men have had their heads shaved to raise money for Ein Berllan – Our Orchard raising over £600 so far. 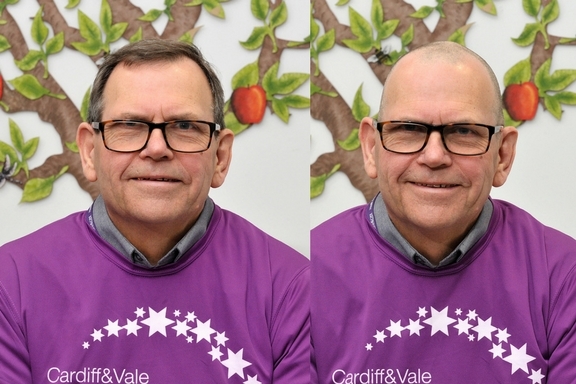 Staff and Unison members from Cardiff and Vale University Health Board; Stuart Egan, Norman Mitchell, Jonathan Aver, Steve Taylor, Andrew Woodman and Steve Gauci all decided to shed their locks to raise further funds to go towards the development of the innovative new space at University Hospital Llandough (UHL). Local barber Yiannie Asprou from Asprou Bros in Barry was on hand with his tools to create a new look for the willing participants. Our Orchard will benefit patients, staff, visitors and the wider community and will be funded entirely through donations made to Cardiff & Vale Health Charity with no NHS monies being spent. Our Orchard will be a semi-natural planted area which has been set aside for the protection of plants and wildlife and will be developed on seven acres of semi-rural pasture land and woodland which makes up part of the UHL estate. UHL is fast becoming a long-term recovery and rehabilitation hospital. For many patients, their conditions and treatment are long term, keeping them away from their friends, family and familiar environments. Our Orchard will enhance the benefits of health and wellbeing while supporting patients on their journey of recovery and rehabilitation. The health benefits of environmental factors and the impact of nature and wildlife upon physical and mental wellbeing has long been recognised and Our Orchard will enhance this vision.